Karimi*, Z., Ghani, A., Mohtashami, S. (2017). Comparative study of essential oil content and composition of Ducrosia anethifolia at two phenologocal stage. 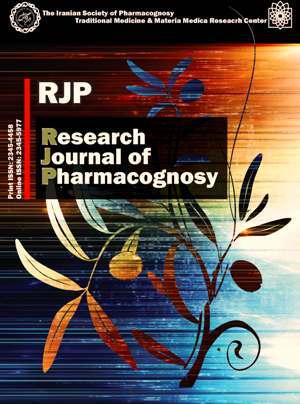 Research Journal of Pharmacognosy, 4(Supplement), 44-44. Z. Karimi*; A. Ghani Ghani; S. Mohtashami. "Comparative study of essential oil content and composition of Ducrosia anethifolia at two phenologocal stage". Research Journal of Pharmacognosy, 4, Supplement, 2017, 44-44. Karimi*, Z., Ghani, A., Mohtashami, S. (2017). 'Comparative study of essential oil content and composition of Ducrosia anethifolia at two phenologocal stage', Research Journal of Pharmacognosy, 4(Supplement), pp. 44-44. Karimi*, Z., Ghani, A., Mohtashami, S. Comparative study of essential oil content and composition of Ducrosia anethifolia at two phenologocal stage. Research Journal of Pharmacognosy, 2017; 4(Supplement): 44-44. 1Department of Horticultural Science, College of Agriculture, Shahed Universtiy, Tehran, Iran. 2Department of Horticultural Science, College of Agriculture, Jahrom Universtiy, Jahrom, Iran. Background and objectives: Ducrosia anethifolia is one species which belongs to Apiaceae family that is used to improve the odor of foods and drinks. It is used also to treat catarrh, headache and backache in folk medicine. The herb is also reported to relax the mind and body and induce a peaceful sleep. The growing stage has an important role in quantity and quality of medicinal plants metabolite. In this study, the oil content and composition of D. anethifolia at two growth stages (full flowering and seed formation) were studied. Methods: Oil content of this plant was isolated by hydrodistillation method by Clevenger type apparatus. Chemical composition was detected by GC and GC/MS analysis. Results: The results showed that the phenological stage had significant effect on the oil content and composition. Oil content at seed formation was more than the flowering stage (0.24 and 0.96% v/w, respectively). At the flowering stage, n-dodecanal (14.43%), dodecanal (13.30%) and n-decanoic acid (11.61%) were the major constituents while in the seed formation stage, they were detected slightly. Besides, at seed formation stage cis-chrysanthenyl acetae (39.06%), cubenol (7.97%) and p-cymene-7-ol (4.30%) were identified as the main composition. Conclusion: The results showed depending on our goal for each plant usage, the harvest time could be different; during seed formation the oil content increased significantly.